Welcome to the season of Lent. For some of us, this is a season of contemplative reconnection with the Divine we long for each year. For some of us, this is a season that reminds us of awful Sundays when we weren’t allowed to play after church as children. For others of us, we are still learning what this whole Lent thing is about. This year at Lyndale, we’re going to be attempting to follow in the footsteps of Jesus in the wilderness, with a special attention to his relationship to resistance to abuses of power like those that appear in this scripture. And we’re going to be paying particular attention to what he is seeking instead, which is healing justice. Healing justice is a recent term, or melding of terms, that comes out of predominantly queer, feminist and people of color lead movement spaces. But it is nothing new. It is a return to the ancient spiritual practices that refuse to separate healing from justice. I don’t think Jesus could have separated healing from justice if he tried, hence all the healing stories of the Gospels we’ll be examining this season. But let me tell you how I understand healing justice. Healing justice means first, interrupting violence – physical, spiritual, political, systemic or emotional violence. Second, it means healing from that violence and making the room and time to do so individually and collectively. Third, it means transforming the conditions that lead to violence in the first place. Note: healing justice isn’t linear. We’re we can be working through all of those steps of healing and justice at once, if we are conscious enough. Let me tell you a story to make things more plain. Or actually, a couple stories. I had been visiting Pam as her chaplain in a nursing home on the upper west side of Manhattan for several weeks. She was a patient in rehab recovering from a fall. She was in her 70s, with long white hair tied back elegantly each day – a form of dignity preserved despite wearing a hospital gown. My job was to visit all the new Christian patients in the nursing home and orient them to the religious services available to them during their stay – whether they were there for rehab or for a more permanent stay. I would go back to see patients again if they requested on-going support. Pam was relatively healthy and on track for a shorter stay. But loneliness and longing were palpable in her being. I stopped by on my rounds to hear the next chapter of her life story whenever I could. She was a fascinating, wise soul. Then one day I showed up in a clergy collar. It was the first time I had ever worn one. My supervisor had challenged me to embody my authority in new ways and I was feeling entirely queasy about it. Clergy collar? Isn’t that for old white dudes in the Catholic church? Isn’t that the kind of religious authority that all too often turns abusive? Isn’t that the kind of power trip that Jesus is telling us to resist in scriptures like this one for today? When I walked in with the collar on, Pam chuckled. It was a nervous chuckle. I asked her what she thought of the collar. She said that she didn’t like it and asked why I was wearing it. I told her it was an experiment, I was seeing what it was like to wear it in the nursing home and how it changed my interactions with people and my experience in the home overall. Then I asked her why she didn’t like it. And the stories poured out. Her father had abused her in every way imaginable. The collar reminded her of her father’s Christianity, one that served as a mask of goodness to the outside world when he was abusing her. I was heartsick. Here I was, a religious authority she actually trusted, and I had ruined it. I was wearing the symbol of her oppression and her pain. But then I had an idea. Or Spirit moved. Or both. I asked Pam if she’d like me to take the collar off. While she resisted with her words, her whole being seemed to relax at the idea. So I took the collar off. And she laughed for real, no more nervous chuckle. “It’s just a little piece of plastic? !” she asked. “Yup, I said,” as I handed it to her for inspection. Smiles. Tears. For both of us. I didn’t have the opportunity to stop the violence of her father’s abuse directly. But our meeting was an opportunity for healing from that violence. She got to hold the collar in her hands and recognize that it was indeed just a piece of plastic, that her father’s authority was not ultimate, but man-made and flimsy, that her resilience was equally if not more powerful. She also became a teacher to me about how I must transform the future of religious leadership and church so that religion can no longer be a mask to hide behind for an abuser. This is healing justice. You know that jail, lovely Lyndale. It’s the jail where Sandra Bland died in police custody after having been pulled over for a ticket while driving. And while black. Rev. Hannah is a young, white, blond, Southern pastor who was serving a church about 50 miles away from where Sandra Bland was killed when it happened. She spent the next year camped outside of Waller County Jail demanding answers, supporting Sandra’s family and friends and enduring 100 degree days in the sun after the county cut down all the trees surrounding the jail in hopes that it would make her and her organizing team leave. She couldn’t stop the violence directly, but she could weep healing tears with Sandra’s family, share countless videos of Sandra’s life on a big social media platform and put her white body and white collar in the face of the Sherifs every day to try to hold the system accountable so there wouldn’t be another death like Sandra’s. This is healing justice too. 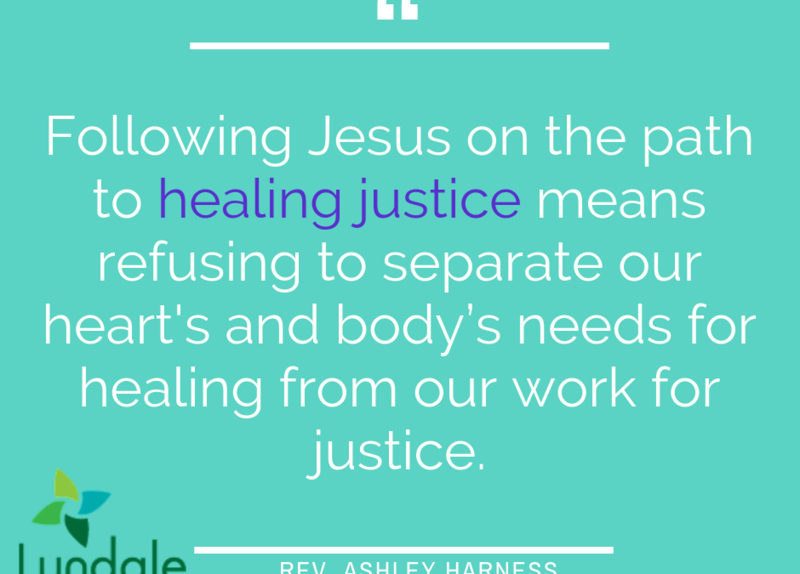 I tell you these stories not to limit your vision of who can follow in Jesus’ footsteps towards healing justice to clergy, but to share with you the vast array of what healing justice means for all of us. We can move towards healing justice in a one-to-one conversation in which a little more healing happens, like what happened with Pam. And healing justice can happen outside jails where tears of grief intermingle with demands for justice, like what happened with Rev. Hannah. And healing justice can happen at any scale in between. What matters is that we refuse to separate our hearts and body’s needs for healing from our work for justice. The reason both these examples are centered around the clergy collar is also that wearing the clergy collar is going to be my spiritual discipline this season of Lent. I like to add a practice for this season instead of taking something away, as is the tradition of how we usually talk about Lent. For me, adding something feels more empowering. You can do either. The point isn’t the how, but the what of the practice. Does it draw you closer to healing justice? Does it draw you closer to the Divine in yourself, in others, in the world? Does it challenge you in some way beyond the ordinary of your day to day life? For me, the collar is all of this. From the first day I wore it back with Pam, I recognized that it changed how people interacted me – for better and worse, but always meaningfully and in ways that challenged me. You all know this collar primarily as my protest collar. I wear it most often at protests to make my clergy presence known when it matters – like at Pride parades where it can be a startlingly healing accompaniment to a rainbow feather boa. But what will happen when I meet one of your for coffee at Common Roots and I’m wearing the collar? What random conversation might I have with a stranger because I’m wearing it? I have no idea. I’m sure this will make me uncomfortable. It’s an outing of sorts. There’s no hiding my clerginess, which is something I want to do regularly, especially as white Christian supremacists rage on their violence. But it will also force me to confront the piece of identity I share with those violent extremists in new ways, following Jesus to resist those abuses of powers. Of course, if for you too, the collar is triggering, I will take it off. It is a symbol of clergy power, not my actual power. I think of it more along the lines of drag, anyway. Drag, as in drag queens, is meant to exaggerate traditional understandings of gender and in doing so denaturalize our relationship to it. In other words, it’s supposed to make us see gender differently, often with humor and joy and excessive glitter, so we can have a more conscious relationship to it. I wear my collar similarly, to make clergy power visible in ways that make us pause, maybe laugh, and ultimately have a more conscious relationship to it. Hence my nails. Have you noticed my clergy collar nails? They are supposed to be funny. It’s ok to laugh. And then there is another dimension of why I’m wearing the collar this month also. As a young queer woman, I have literally been asked while wearing the collar if it’s a costume – so resistant are some brains to seeing me as a pastor. On my body, the collar is a form of resistance to misogyny and heterosexism. It is a statement for me, as Rev. Hannah said, of who sent me. It is part of the healing and the justice I need these days. As we dive into this season of Lent, I have some questions for you. What healing do you need? What justice do you seek through your resistance to the powers that taunt you? Where does that healing meet that justice? What practices can you play with in this season that help you remember you are made in the image of God and no other power can heighten or diminish that power? I don’t know the answers for you. But may you have the strength to live the questions this season of wilderness wandering. Amen.